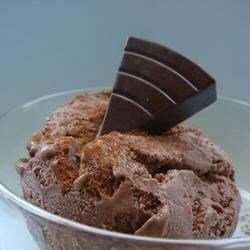 This is a gourmet blend of smooth and creamy dark chocolate frozen custard with cinnamon. Garnish with an extra sprinkle of cinnamon and a piece of dark chocolate on top. Whisk cream, milk, sugar, and cocoa powder in a saucepan over medium heat until the mixture is thoroughly combined and the sugar has dissolved. Bring almost to a simmer and stir in dark chocolate until melted. Whisk egg yolks into the cream mixture and cook until batter is slightly thickened, 1 to 2 minutes. Transfer to a container, cover, and refrigerate until chilled, at least 6 hours. Stir cinnamon into chilled custard batter and freeze in an ice cream machine following manufacturer’s instructions. Sprinkle frozen custard with more cinnamon to serve.